For her directorial debut, Amber Tamblyn chose to adapt a piece of pulp fiction. At least it feels like one: She and co-writer Ed Dougherty adapted a novel by “White Oleander” author Janet Fitch that puts a sensational spin on grief, one so melodramatic that at times it feels like a horror parody. You’re already familiar with Mommie Dearest; get ready to meet Mommie-in-Law Dearest. Then she gets a ring from the police: Michael’s dead by his own hand. The moment is nicely dramatized by Shawkat but then overdramatized by Tamblyn, who uses what might be characterized as an echo effect, except echoes usually grow quieter instead of sounding like the person is merely repeating herself. So Josie, though now in a state of shock, does her usual: gets drunk and goes to a club to mosh. (The slo-mo depiction of her being pushed in every direction certainly must mean something — emotional whiplash, perhaps?) 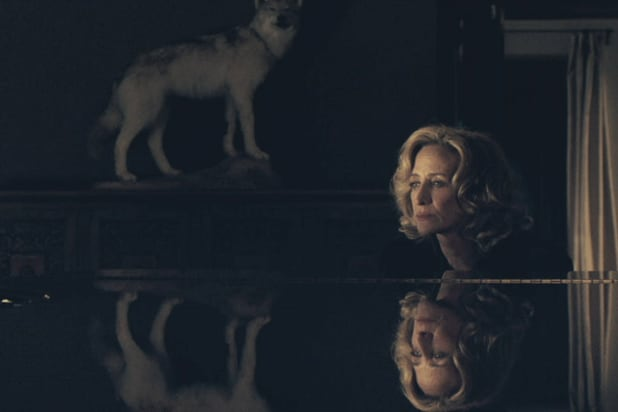 And later that night, another call: Michael’s mother Meredith (Janet McTeer) hisses, “If my son had never met you, would he have killed himself?” It may sound like the stuff of mourning, but really it’s a gauntlet thrown. And boy, is this proven at the funeral: There’s nearly another death as Meredith turns demon-like, pulling toward her a carpet runner to prevent Josie from escaping. The pair alternate devious acts for the rest of the film, ones that actually further devolve into absurdity. Tamblyn may very well have encouraged McTeer to spin into a ludicrous lioness, but her performance doesn’t play well opposite Shawkat’s. The latter ultimately gets a chance to prove herself in a star turn, but she keeps Josie too grounded, too realistic to become any threat to Meredith. Shawkat breaks out subtleties that she’s never been able to show off in other roles: Josie’s quick hitch of a shoulder to steel herself, for example, or looking dead-eyed as she sits at the end of the bed she shared with Michael. She’s too believably human to take part in this spectacle. On Meredith’s end, there’s only one moment in which she appears three-dimensional, but it’s in a move that’s a culmination of other hard-to-swallow plot swings. (Let’s just say some spooning takes place.) At one point she offers Josie, “I can’t take anymore. Can you?” And just when you feel like you can’t take anymore yourself, the film quiets down and turns sweet, warm, and heartbreaking. The ending itself is abrupt and random, involving a motel cleaning woman. Nonetheless, it’s a refreshing tonal change after nearly 90 minutes of soap-opera theatrics.